1 of 3 Line 8 x 8 x 2-inch-square baking dish with plastic wrap, with wrap extending over two opposite sides. 2 of 3 In medium-size bowl, beat together cream cheese and coconut extract until light and fluffy, about 2 minutes. 3 of 3 In second medium-size bowl, beat heavy cream and confectioners sugar until soft peaks form. Gently fold one-quarter of the whipped cream into cheese mixture. Fold in remaining whipped cream mixture. Spread evenly with rubber spatula into prepared baking dish. Refrigerate 24 hours. 1 of 4 In small bowl, whisk together rum and cornstarch until cornstarch is dissolved. 2 of 4 In small saucepan, heat together pineapple juice and granulated sugar to a boil. Whisk in cornstarch mixture; cook, whisking, until thickened, about 1 minute. Transfer to small bowl; cover bowl with plastic wrap; refrigerate sauce until ready to use. 3 of 4 Holding plastic wrap hanging over edge of dish, gently lift up cream cheese mixture from baking dish and place on a work surface. With cheese mixture on the plastic wrap, and using a 2-3/4-inch heart-shaped cookie cutter, cut out 6 heart shapes from cheese mixture. 4 of 4 To serve the dessert, spoon the pineapple sauce onto the middle of 6 dessert plates, dividing the sauce equally. Top each pool of sauce with a cheese heart. 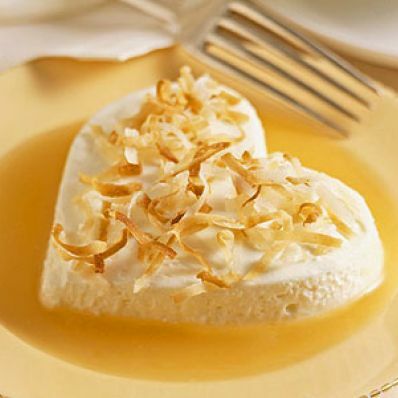 Garnish the top of each with a sprinkling of toasted coconut, dividing equally.